For the first time, the Maryland-born experimental rockers play the home-state venue which begat the title of their monumental 2009 album. What a long, strange trip it’s been for Animal Collective. The boys who would become Avey Tare, Panda Bear, Geologist, and Deakin met more than a decade ago while growing up in the Baltimore suburbs, where they experimented with drugs and music and began conceiving the sound that would eventually make them one of the world’s biggest experimental rock bands. It’s been two and a half years since they released the masterful Merriweather Post Pavilion, a trippy, extravagant and widely acclaimed eighth album they named for an amphitheater in Columbia, MD., not far from where they grew up. As teens, they associated the venue with acts that could be thunderous and psychedelic all at once, like the Grateful Dead. Animal Collective was certainly both of those things Saturday night at Merriweather — the band’s much-anticipated first show there and the capper on a 2011 homecoming that saw the members wintering near Baltimore to work on their next album. But despite a solid showing of Deadheads, throngs of fans smeared in neon face paint, and stage props suggesting a low-budget Phish show, this wasn’t a hippie-friendly show. Not exactly. It was definitely psychedelic. The visuals? Think Monster Mash meets Day of the Dead. White ghost forms swayed from the ceiling. A string of glittery orange Cthuhlu shapes — or were those Wu-Tang logos? — stretched above the band, who performed in front of a massive mosaic skull whose sockets lit up with zygote-like projections. Like the Dead, no member stood at the center; instead, bulbous paper lanterns pulsed with color while the band generated swirling, implacable sonics. You couldn’t get baked to this music. Animal Collective asks a lot of its fans, chiefly because it mostly sticks to fresh material at concerts. On Saturday, it played 10 new songs, presumably candidates for the band’s next album. While their last record took inspiration from an imagined underwater Merriweather, the new material finds Animal Collective role-playing an extraterrestrial band reinterpreting Earth-bound noises, or at least that’s what members David Portner and Brian Weitz told Baltimore City Paper last week. But the new songs still maintained an aquatic lustre, gurgling beneath rangey guitars and overwhelming rhythms. On Saturday, even the most otherworldly sounds felt organic and textural, crunching and squishing as though they contained gristle and guts. You had to pay close attention. You also had no business staying seated. Much of the new material was booming and panoramic; everything — from Portner and Josh Dibb’s guitars to Weitz’s table of pedals, samplers, and other electronic debris — orbited around Noah Lennox’s concussive drums. Thank manpower, maybe; this is the band’s first tour in several years with Dibb, freeing up every member to craft a richer, bigger sound. Or perhaps instead of creating a pocket world, as the band did on Merriweather Post Pavilion, Animal Collective is now more interested in music that could shake one. The new songs took several forms, most of them massive-sounding: lengthy, crescendoing explorations; carnival-esque fast-burners; disorienting battle marches; and even one pseudo-ballad. The band’s signature touch is still its dense, treated vocals — Portner’s elastic rasp, Lennox’s blissed out angel cry. Harder to detect were the disarming pop hooks fans became used to with Merriweather Post Pavilion. Wisely, the band laced its set with souped up versions of favorites “We Tigers,” “Did You See the Words?” and three songs from Merriweather. With the opening words of “Brother Sport” — “open up your / open up your / open up your throat” — the crowd did just that, erupting into rave-like glee. Animal Collective’s evolution could have gone a different way. Following a warm-up set by Dirty Projectors member Angel Deradoorian, Black Dice offered a reminder of that fact. 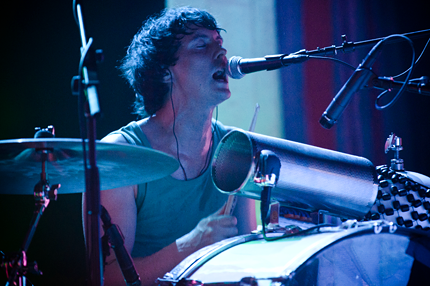 Black Dice and Animal Collective came of age together in Brooklyn in the early 2000s, and on Saturday the former band offered its usual pulsing art noise, which strangely felt large enough to fill the amphitheater even though the trio was clustered tightly at the front of the stage. Once upon a time, both bands made music that evoked childhood (read: little boys hitting things), but where Black Dice’s mode was destruction, Animal Collective preferred to explore. The group could have easily doubled down on its entropic side following 2003’s Here Comes the Indian, but instead Animal Collective leaned on its sweeter elements, and beginning with 2004’s Sung Tongs it crafted an impressive tetralogy of risky, singular art pop.